A pair of English lions of cast-iron from the 19th century on stands. 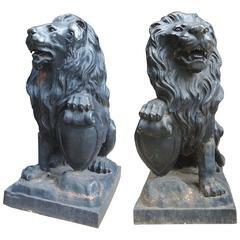 This antique pair of cast-iron lions from England are each one half of a pair, with front position being shown at side to create a perfectly seated pair, which have then been raised upon custom iron stands with round-shaped bases. This large pair of lions have gorgeous, full manes of hair, are seated with front paws up, and one half of the pair an alert, upturned tail. They have a wonderful rusty and chippy paint patina, with much of their original coloring still in tact. Please note due to the nature of the cast-iron and iron bases, that these pieces are quite heavy. 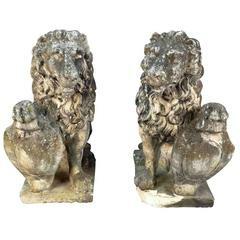 This fabulous pair of English 19th century lions are ready to take their admirable positions standing guard at your home, perhaps flanking an entry, indoors or out. Great wear, patina and chippy paint throughout. Wear consistent to age and use. Please refer to the various additional photos for further condition detail. Antique cast iron mask of satyr. An architectural element. 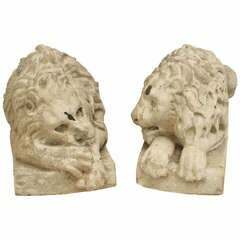 Carved marble figures of two reclining lions each resting naturalistically upon its own rectangular base. 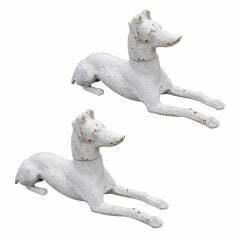 Set of two cast iron whippets painted white. 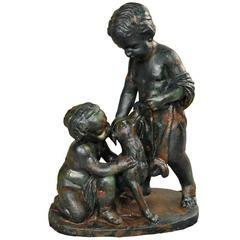 Please see images for detail of patina.